Old School RuneScape : Please note that you must have RuneScape membership to participate in this beta test. Initially there will only be a select amount of installs available, meaning access is on a first-come-first-serve basis. We will make more installs available each week so please monitor our social channels for the latest updates! The world’s largest and most popular MMORPG, Old School RuneScape has been played by over 260 million players since the 2001 release of RuneScape. Old School RuneScape unites the intricate mechanics of modern MMOs with the nostalgic point-and-click gameplay of early role-playing games. Choose your own path. Play as the lone adventurer seeking glory through individual challenges, or band together with other heroes to leave your mark on the game. With 23 skills to master, hundreds of lore-filled quests, and dozens of unique raids and bosses to defeat, Old School RuneScape has a challenge for everyone. 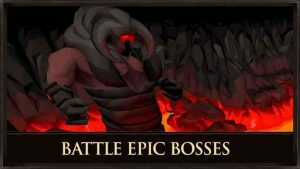 Battle through two extraordinary raiding encounters: the Chambers of Xeric, and the Theatre of Blood. Undead dragons, volcanic monstrosities, and tyrannous vampyres await all challengers seeing great treasures. Adventure anywhere with an innovative cross-platform approach to mobile gaming, which is truly revolutionary among MMORPGs. Whether you play with mobile or desktop, you’ll be playing on the same account on the same game worlds. Be the first to traverse Fossil Island and uncover its lost history. Map the heated tropics of the Karamjan jungle, and brave the barren wastes of the Kharidian desert. Old School RuneScape is a game by the community, for the community. Participate in content polls to decide what updates the game gets. Join the thousands of player-run clans, groups, and alliances which pride themselves in being the best at defeating bosses, killing other players, or mastering different skills. Assert your dominance over your victims in Old School RuneScape. From quarterly Seasonal events with big cash prizes to day-to-day open-world player killing in the Wilderness, the chance to reign supreme is yours to take. Love the fact I can play this on the phone now, been dreaming about this for 10 years. Everything is great. Boxes and magic spells need to be bit larger because currently a bit hard to click them. Might be better on 10 inch tablet but haven’t tried it yet. But overall I love it and my dream has come true for RuneScape on the go. 🙂 10/10 Edit – You made XP to show instead of skill menu which is good.make this also for attack style so we can read the style like str xp Def XP etc… And do it for other similar menus. Can you also include the lvl number on the XP popup even on XP counter? Overall, beautiful product. No issues with connection or rendering or anything of the sort. The game can be hard to multi task in which, upon return, says disconnection and takes time to get back in to the game. A few of the panel hit boxes can sometimes be tricky to hit. And I’m constantly getting notified in my private chat box even though I have no messages. I do have a bit of a battery drain issue, but that’s more than likely due to having my phone for 3 years. Other than that, absolutely love it and can’t wait for it to be released to everyone.